NEVER BEFORE have these two giants of choral madness appeared together on one stage. EXPERIENCE the MEN OF THE WEST and the BALLPOINT PENGUINS as they walk the tightrope between comedy and good taste. HEAR them performing together on the flying a cappella trapeze, with no instrumental net, without falling flat! THRILL as they ride the wild horses of dynamic expression and method acting! WATCH them tame the lions of integrated song-and-dance moves and polyphony! 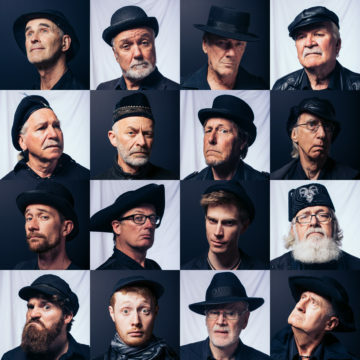 Part pointless grandeur, part theatre, part sing-a-long with a 14-strong group of strangely be-hatted men dressed in black. With humour mixed with some fine strong harmonies, it’s time for you to realise your expectations of joining a male choir.